The announcer of the opening act never identified himself. He simply mentioned that Marty had performed with this group when he was very young. Jerry and Tammy Sullivan came on stage (with two other singers) and they sang "Up Above My Head / Blind Bartimus." Marty's band was on stage during the performance. Marty came out on stage when Jerry and Tammy were finished. "Somebody say 'HOWDY'." The audience yells and screams. Marty continues, "We're glad to be here with you. Happy Fan Fair. Thank you for coming to town. I hope you ain't sleepy coz you're gonna stay up all night if you hang out with me. We've got a great show for you tonight. I'll tell you what I know of. 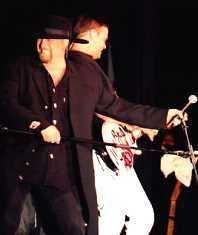 We got Montgomery Gentry comin' by to see us. Pam Tillis is here. Brother Travis Tritt is in the house somewhere. Yeah, he's here. We've got the Tennessee Mafia Jug Band comin' out. A cousin of mine from California -- actually by way of North Carolina lately......Unknown Hinson is here. I know you don't know him, but that's what Fan Fair's about. You don't know everybody." 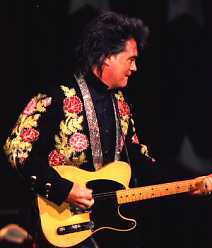 Marty's guitarist, Kenny Vaughan, was messing with his guitar. "Kenny Vaughan, you got a string on yet? He's workin' on it. He's workin' on it. What do you think about the back of my band? I haven't felt this good since I got off Willie Nelson's bus the last time." The audience roared. Marty then goes into a Willie Nelson impression and sings "Maybe I didn't love you......."
"We've lost some dear friends. We lost Waylon last year and Harlan Howard. We're gonna dedicate this show to Waylon and Harlan." Marty and the band kicked into "Hey Baby." Marty sounded great and the new band played great. I believe Marty has a more rock and roll sound than country with this band. "At the end of this night........" Someone yelled out an "I love you." Marty says, "I love you, too. Yes I do, I do, I do." He continued, "At the end of this night, if you enjoyed yourself, tell everybody you came to our First Annual Late Night Jam. We are going to do it again next year and the next year and the next." The audience applauds and screams. "You know where you got it. 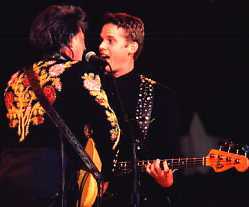 But if you didn't enjoy it .... just think we weren't that good, tell 'em you saw Travis Tritt." A lot of laughter from the crowd. "I'm gonna sing you two new songs now." 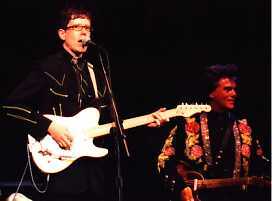 Marty and the band performed "Country Soul" and "I Surrender," two great songs that Marty has written with Paul Kennerley. Ah, time to introduce the band with no name. "Do me a favor and make welcome on the bass guitar tonight, Mr. Brian Glenn. Brother Brian Glenn. Back here on the drums is one of my heroes. We've made a lot of records together and done a lot of projects. He's absolutely the best. How about a hand for Mr. Harry Stinson. Handsome Harry Stinson. On the guitar is long, gone Kenny Vaughan. How about a hand for cousin Kenny Vaughan." The band broke into the song, "Tempted." "Clap your hands," Marty told the crowd. Then it was time for Kenny Vaughan to show off his talent on the guitar -- and to sing too. 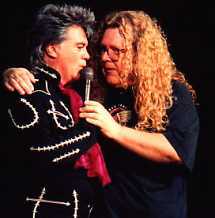 He sang "Walk Like That" with Marty helping out on background vocals. Kenny is awesome on lead guitar. I've seen Kenny perform around town with other artists and his guitar playing appears effortless. "Looks like I could get a drink of water around here as much as I paid for this building." Ask, and you shall receive. Marty proceeds to gargle it down at the microphone. "Gargling at the Mother Church of country music. Ain't this a nice place to play?" The audience applauds. "I promise you this is the best honky tonk on lower Broadway. It really is." "Are my boys ready?" Stalling for time, Marty says, "How many of you went to the Flameworthy Awards Show? Was it a good show? Thing that I enjoy when I watch country music awards shows .... man we are uptown. Country singers are spiffy looking these days. They're sharp. Girls are pretty; boys are cool lookin'. It looks like everybody went to New York City and got dressed to go to a country awards show. That's all right. That's the way it goes. It's very cultural. And I thought what I wanna do tonight is just give you a little bit of my culture. I wanna introduce you to my side of the tracks. Here's my boys, the Tennessee Mafia Jug Band." The audience really applauded upon seeing the guys walk on stage. 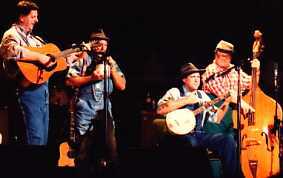 The Jug Band performed "No Letter In The Mail Today" with Marty on mandolin. "Outstanding, YES!" Marty exclaimed after the song. "The fellow over here with the banjo -- Lester come here and introduce your orchestra." Lester Armistead introduced LeRoy Troy on banjo, Matt Combs on fiddle, son Michael on guitar and the most handsome was Ernie Sykes on the upright bass. A chair was brought out on stage for LeRoy. Marty says, "The fellow sitting down here on the stage is the King of country music. Mr. LeRoy Troy. Would you all give LeRoy a hand." Deadpanned, LeRoy says, "Is that all I get -- just one microphone?" He is hysterically funny. 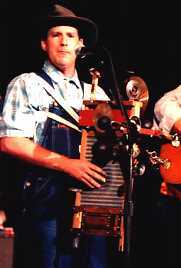 He performed "Bottle of Wine" doing his famous banjo spins. There is no end to LeRoy's talent. He gets into this "interesting" contraption consisting of a washboard, horns and other bells and whistles and they perform "The Bicycle Song." After the song, Marty says, "You all stick with me. I'll show you some class and culture, baby." He then asked for a cordless microphone and he proceeded down the steps from the stage and into the audience. Marty asked someone, "Where're you from? Mississippi? That's where I'm from. What part?" The person answered they lived 15 miles from Robinsonville. Marty says, "We're probably kin. Everybody in Mississippi is kin. Glad you're here. Welcome!" Moving along the aisle, Marty asks someone, "Who's your favorite hillbilly singer and don't say me." The person replied "All of them." Marty says, "That's a Mississippi answer." He continued walking up and down the aisles. He asked one audience member, "Didn't I used to be married to you?" Marty shook hands and said "hi" as the audience screamed "over here, Marty." At one point, Marty looked up at the balcony crowd. "Oh wait a minute," Marty mused. "Jump, jump. I'll catch you. It's okay. Come on." "I wanna know, is there anybody from Australia?" Someone raises their hand. "You are not. Are you really? You're from Australia? Talk to me. Prove it. Say 'Aye'. Say 'Outback Steakhouse'." Marty continues walking, "Oh man. How many people bought cowboy clothes when they came to Nashville? Tell me the truth? Where are the cowboy clothes? Carolyn (Thumann), come here. Show 'em your legs." Carolyn shows off her boots. "Cool," Marty says, "K-Mart. Nah, that's Manuel." "Who's got a camera? I wanna take some pictures. I got a book out. I take pictures for a living sometimes." He finds someone to hand him a camera and he takes a picture of the person. Marty's just killing some time. "Are the boys hooked up, Les? Almost? I appreciate Montgomery Gentry coming here. They are good guys. They are good rebel boys. The truth of the matter is ..... I thought about doing this show last year here at Fan Fair when they moved it downtown and I wanted to do a show that had all kinds of different country music coz I believe country music is still a family and I love the country music family. I mean, where else can you get honky tonk, the smooth sounds of bluegrass, or old time and mountain music, and rockabilly and western swing? We've got it all in country music. 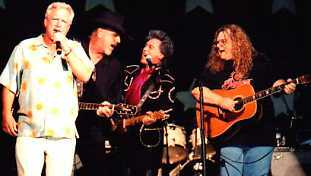 And I love people that come out with their own sound and these boys worked hard in the honky tonks up in Kentucky. They got together. I loved 'Hillbilly Shoes'. That was a good song. 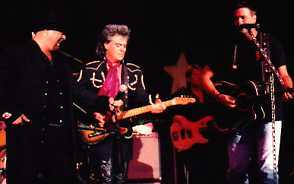 So without further adieu, would you make welcome my brothers from Kentucky, Montgomery Gentry." Eddie Montgomery and Troy Gentry took the stage. I'm not crazy about their music, but they sure put the crowd in a frenzy. Eddie twirling the microphone stand, running all over the stage. Their music is loud and quite rock and roll. They opened with "All Night Long," then went into "She Couldn't Change Me." They performed the first single ("My Town") off their upcoming album. Another song on the album will be "Hell Yeah." Marty joined them on their closing number, "Hillbilly Shoes." "Did I see Richard back there? Richard Young, where are you? Where's Richard? Come here. I love the Kentucky Headhunters. Say 'hello' to my brother Richard Young. Ladies and gentlemen, a Kentucky legend, brother Richard Young. Richard comes out and says to Marty "We got another one back there." Marty says, "Who is it?" Richard says, "T. Graham Brown." Marty says, "Where's Graham? Come here Graham? It's all good, it's all gold. I told ya we old. Man, we ain't stayed up this late in a long time. Hey Brown." His T-ness says, "Holy Mackerel." Marty says, "Richard, I ain't had a haircut in 20 years. You?" Richard says, "Yeah, my wife cuts mine every six weeks." Marty says, "You gotta stick around and sing." Marty goes and gets his guitar. 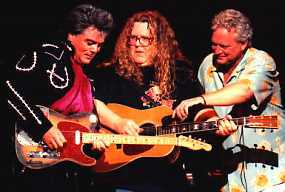 Marty, Richard and T. Graham sing "Walk Softly On This Heart Of Mine." Richard says, "That wasn't bad for not rehearsing, was it?" T. Graham then sings "Today, I Started Loving Her Again." Ray Benson from Asleep at the Wheel came out and joined in. "You got time to stick around?" Marty asks his guests. "My cousin over down in Charlotte, North Carolina. I've heard about him a lot. He's been in jail for 30 years. You seen him? 30 years. 30 years, man. Without teeth, I'd look like him. That's right. If you'd been in prison for 30 years, you wouldn't have teeth either. My cousin, I got a call from him last fall and he told me he was outta jail and I was happy to hear it. He had a band started. But he changed a lot when he was in jail. He ain't the same boy now that he was when he was in there." T. Graham interjects, "You know what, Marty?" Marty says, "What, Brother?" "Womens loves him," T. Graham says. "Womens loves him?" Marty asks. "Coz he's the King of the country and western troubadours. Is he anywhere close to being ready?" Marty spots someone off stage. "Hey Gibbons, come here. Hey Gibbons." ZZ Top legend Billy Gibbons walks on stage. The audience goes wild. Billy comes to the microphone and says, "Ladies and gentlemen. 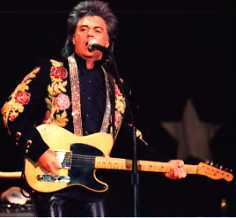 Give a big hand to my friend, Mr. Marty Stuart. You know T. Graham Brown, of course. Big Ray Benson. This looks like a Headhunter, but I lost my head a long time ago. I'm not afraid of him. Wait -- my cell phone's ringing. Hello. No. I know. They still owe me $20. Each of them. I'll settle for $6. I love these guys. Give them a big hand." Still stalling for time, Marty says, "Brown, you never know about your country music brothers. Last time I saw Brown, he was selling log houses. Do you remember your rap?" T. Graham goes into his spiel for selling log homes "made with Southern yellow pine, the hardest of the soft woods." Marty says "What's that number again, T. Graham Brown?" T. Graham says, "706/274-3201. That is 706/274-3201. Triple A Log Homes." Marty adds, "Remember, you heard it here at the Marty Party Late Night Jam. T. Graham Brown, Ray Benson, Kentucky Headhunters, ZZ Top. We all love Triple A Log Homes." "We're gonna get my cousin out here. He is ready to go? Ladies and gentlemen, from parts unknown ..... you all be nice to him. It's his first trip out in public. He's a little edgy, but stay with him. He's cool. Would you please make welcome, my cousin, Unknown Hinson." Walking out on stage was this vampy looking guy in a Manuel type jacket. He had a bass player and a drummer with him. Marty says, "I like your show clothes. See, it runs in the family." 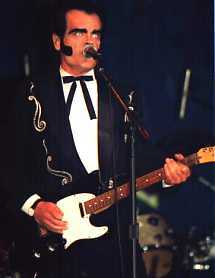 Unknown Hinson is the alter ego of Danny Baker and is quite well known in the Charlotte, NC area appearing on TV shows, including The Unknown Hinson Show. His songs are hilarious. He performed "I Want You Now On A Silver Platter," "(I Can't Believe You're) Pregnant Again," "Fish Camp Woman," "Hippie Girl" and "I Make Faces When I Make Love." Don't let his "act" fool you. He is one terrific guitar player. He has an album coming out on Capitol Records. After Unknown's performance, Marty says, "I told you country music's a family. You gotta love us all."